All mechanical structures of the spacecraft have been successfully deployed following their long journey into space, according to ISS-Reshetnev satellite systems. 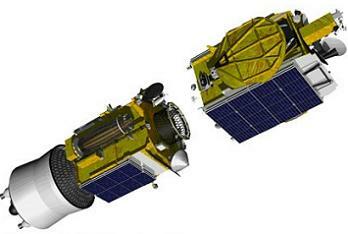 Having completed the attitude determination phase, Loutch-5B and Yamal-300K are now subjected to the in-orbit testing to validate the performance of their major subsystems. The Proton booster that launched the satellite duo was 4.1 m (13.5 ft) in diameter along its second and third stages, with a first stage diameter of 7.4 m (24.3 ft). Overall height of the three stages of the Proton booster is 42.3 m (138.8 ft). The Proton vehicle has a heritage of around 400 launches since 1965 and is built by Khrunichev Research and State Production Center, one of the pillars of the global space industry and the majority owner of ILS. 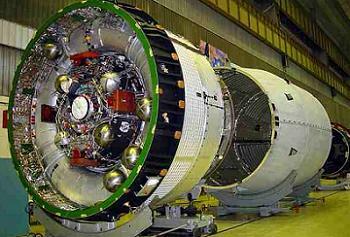 The Briz-M (Breeze-M) upper stage is the Phase III variant, a recent upgrade which utilizes two new high-pressure tanks (80 liters) to replace six smaller tanks, along with the relocation of command instruments towards the centre – in order to mitigate shock loads when the additional propellant tank is being jettisoned. The mission utilized a 4-burn Breeze M mission design following lift off from Baikonur. The first three stages of the Proton used a standard ascent profile to place the Orbital Unit (Breeze M Upper Stage and the passengers) into a sub-orbital trajectory. From this point in the mission, the Breeze M performed planned mission maneuvers to advance the Orbital Unit first to a circular parking orbit, then to an intermediate orbit, followed by a transfer orbit, and finally to a near geostationary orbit. Separation of the satellites was staged approximately 9 hours and 30 minutes after liftoff. Loutch-5B was developed and manufactured by ISS-Reshetnev for the Russian Space Agency within the guidance of the Federal Space Program for years 2006-2015. It is the second satellite of the multifunctional data-relay system Loutch intended to provide real-time communications between ground stations and low-orbiting spacecraft, launching vehicles, their upper stages and the Russian segment of the International Space Station. Yamal-300K was designed and built by the Reshetnev Company for Gazprom Space Systems under the Federal Space Program. The satellite will offer communications, television broadcasting and high-speed Internet access services to users across Russia. The spacecraft is based on ISS-Reshetnev’s Express-1000H unpressurized medium-class platform. It has been designed to operate for as long as 14 years to provide services to Russia and CIS countries.